Ace said that soldiers from Venus were enlisted to serve under Endymion, who we know was on the side of the Moon Kingdom in the fight against the Dark Kingdom, so it's probably safe to assume that Endymion's army was defending the Moon Kingdom from the Dark Kingdom. Is the Moon Stick actually Sailor Venus's item??? 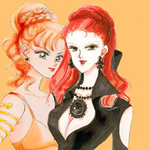 It's possible that the game's programming (likely by Artemis) was to further the ruse of Sailor V(enus) being the Moon Princess before the truth came out. 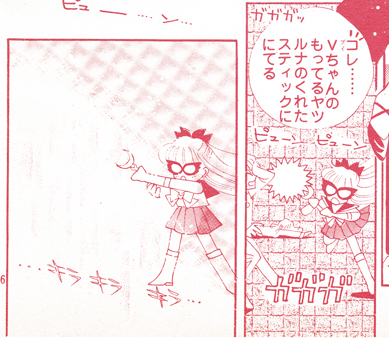 As I discussed on page 2, I've wondered as to whether or not the Moon Stick rightfully belongs to Sailor Venus. It's meant to belong to the leader of the Four Guardians, which is her position; it fits in with her crescent moon imagery; Sailor V wields a Moon Stick lookalike item in the arcade game; and there's that one illustration where we see Venus holding the Moon Stick (in its elongated form). That Moon Stick's design is completely different from either the original or the revised designs. Even though it's a little bit sketchy, it still doesn't really match up with the other designs. It's hard to believe Naoko just forgot what the Moon Stick looked like, so this makes me think Queen Serenity was indeed meant to be wielding a different (albeit similar) item. Crystal did use the actual design for this scene, although Crystal is not reliable. I think Luna said it belonged to the leader because of her fuzzy memory and it was indeed supposed to be for the heir of the Moon. I'd forgotten about the notion of Luna's memories having been (deliberately?) fuzzied, unlike Artemis who had retained all of his past life knowledge, so there is that to also consider when Luna describes the ownership of the Moon Stick. That's a fair point. I'm sure the Moon Stick is meant to be Usagi's/the Moon Family's, but I think it's interesting that there's still plenty of room to speculate it might rightfully be Venus's. Such ambiguity is surely a sign of Naoko's sloppy storytelling genius. And it turns out that Takeuchi's memories are also fuzzied regarding the item. I'm sure the Moon Stick is meant to be Usagi's/the Moon Family's, but I think it's interesting that there's still plenty of room to speculate it might rightfully be Venus's. 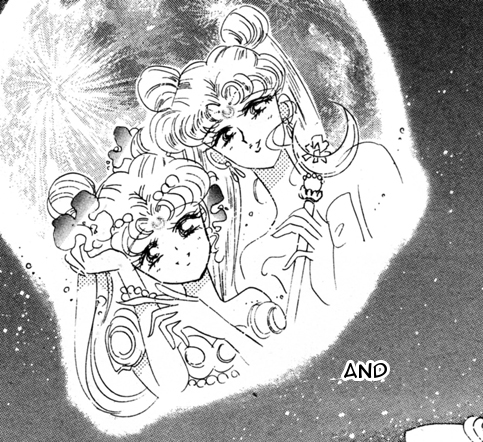 Usagi stole Minako's life! 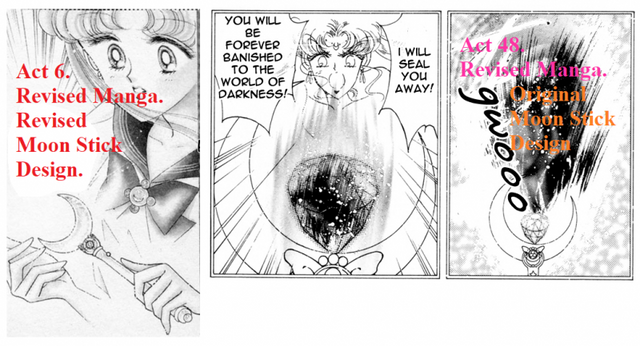 Knowing about Naoko's original ideas regarding Sailor Moon and Sailor Venus like her giving Venus moon-related imagery, making her the star of the proposed anime or even when after Usagi was born the manga was still planned to be called Pretty Soldier: Sailor V fuels the theory of Minako as a mirror image to Usagi (or is it the other way around?) 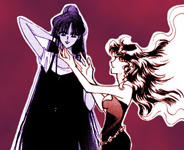 Someone should make a meta fan film where Venus is tired of playing second fiddle and comes to reclaim her rightful place to both the throne and manga/anime history.